Ballet Folklórico Nacional of Milwaukee is an innovative, theatrical body of dancers committed to the preservation of one of the richest artistic manifestations of tradition and culture in Mexico – “El Folklore”. 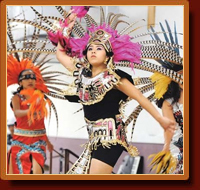 The group was founded by enthusiastic dancers with different degrees of experience in Mexican folk dance and traditional Aztec dance, their mission is to promote Mexican Folklore dance with quality and authenticity. Mexican folklore is a continually evolving dance form based on tradition and ritual that touches the performer and audience's soul. The Ballet Folklórico Nacional brings tradition, art, culture, and history to all its audiences. Every performance lights up the stage with its dazzling costumes and colorful depictions of Mexico’s diverse culture and folklore. The group offers and array of dances from different regions of Mexico. Our repertoire includes the following regional dances but is not limited to: Traditional Aztec Dance, Michoacan, Durango, Veracruz, Chiapas, Yucatan, Sonora, Norte (Polkas), Oaxaca and Jalisco including "Floreo de Soga" Trick Roping. We hope by teaching and promoting this tradition, we will open a window to a new discipline for others to discover, and cultivate a desire to research and explore this art form.